While talking heads debate the media's alleged conservative or liberal bias, award-winning journalist Bonnie Anderson knows that the problem with television news isn't about the Left versus the Right--it's all about the money. From illegal hiring practices to ethnocentric coverage to political cheerleading, News Flash exposes how American broadcast conglomerates' pursuit of the almighty dollar consistently trumps the need for fair and objective reporting. Along the way to the bottomline, the proud tradition of American television journalism has given way to an entertainment-driven industry that's losing credibility and viewers by the day. 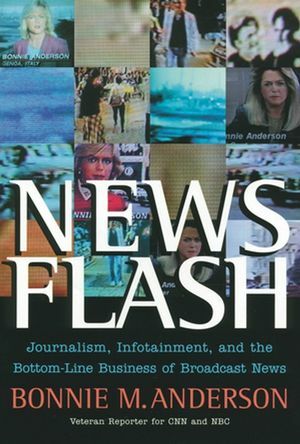 As someone who has worked as both a broadcast reporter and a network executive, Anderson details how the networks have been co-opted by bottom-line thinking that places more value on a telegenic face than on substantive reporting. Network executives—the real power in broadcast journalism—are increasingly employing tactics and strategies from the entertainment industry. They "cast" reporters based on their ability to "project credibility," value youth over training and experience, and often greenlight coverage only if they can be assured that it will appeal to advertiser-friendly demographics. Bonnie M. Anderson is a twenty-seven-year news veteran who has won seven Emmy Awards and been a finalist for the Pulitzer Prize. She began her career as a print reporter for the Miami Herald, the Miami News, and Gannett Newspapers, and spent ten years at NBC News and close to ten at CNN. Anderson currently provides media training for executives, journalists, and other professionals.